Jessica Langer, left, is one of three recipients awarded the Dr. Diters Scholarship from The Canton Community Health Fund (CCHF). Chair Lynn Miner awards her scholarship. Langer will study nursing at Northwest Community College. July 5, 2016 – The Canton Community Health Fund (CCHF) recently awarded over $26,000 to Canton organizations and projects that contribute to the health and well-being of Canton. CCHF also awarded three scholarships to two Canton high school seniors and a Canton resident pursuing careers in a health-related field. CCHF has been awarding thousands of dollars annually for over fifty years. This year’s recipients fund a variety of projects that support CCHF’s mission. “We have many projects this year that have a profound impact on the health of all residents,” says Lynn Miner, Chair of CCHF. Canton Parks and Recreation Department’s award will purchase a second shade structure for the wading pool. The first structure was funded in full by CCHF. 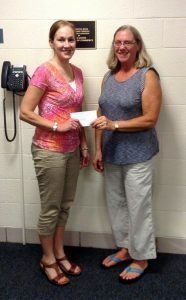 FAVARH received much-needed funds to continue a special needs play group. The Canton Police Department award will purchase combat applied tourniquets used by first responders during emergencies. The Spirit Horse Therapeutic Riding Center of Canton will offer therapeutic riding lessons for Canton children with special needs. The Food Bank also received funds. Focus on Canton received funds to help residents that need temporary financial assistance. Canton Intermediate School was funded for a second year. Funds will be used for phase two of a food-recycling program begun last year. View the complete list of past and current recipients at cantoncommunityhealthfund.org. Additionally, two Canton seniors and a Canton resident pursuing an education in a health-related field were awarded the Dr. Diters Scholarship. Sarah First will attend The Catholic University of America in Washington, D.C.; Morgan Schroeter will attend Simmons College in Boston and Jessica Langer will attend Norwest Community College in Winsted, Conn. All will study nursing. The scholarship was named after a longtime local physician, Dr. Diters, a beloved family physician who practiced medicine in Canton for many years. The first recipient of the Dr. Diters Scholarship is now a practicing pediatrician.